New this season from Rossignol is the new Evo OT (Off-Trail) skis, based on the best-selling Evo Tour that we reviewed last season. The Evo OT fills the gap between the versatile Evo Tour, which can be used on grooved tracks as well as in light backcountry snow, and the full backcountry models. For more stability and float off trail, the skis are wider, with partial metal edges and a thinner, lightweight core. Like the Evo Tour, the base is a waxless Positrack surface to allow for grip and the ever-present compromise between kick and glide. The new T3 Auto binding is meant to work with the Evo OT, providing a hands-free, easy-to-use click-in/click-out traditional screw-mount for recreational off-trail skiing. The non-NIS compatible mount accepts touring boots. Also new this season to pair with the Evo OT setup is their X5 OT touring boot, which builds on their existing touring boot by adding Cordura lace covers and a Thinsulate lining for increased warmth and water resistance in off-track conditions. Also features an external cuff gaiter to keep the snow out. 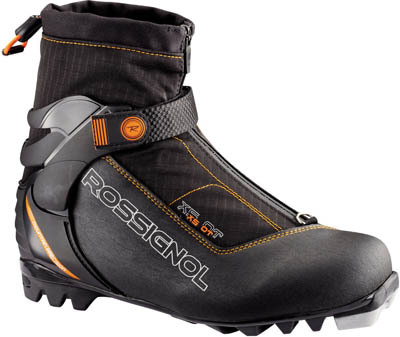 The boots are thermo-moldable to form them to your feet. Also available in FW (For Women) fit. Rounding out the Rossignol OT package is the lightweight 5058 aluminum touring pole with a plastic grip.